Since I started my articles on the early development of photographic lenses, I’ve been wanting to write an article on the development of the first cameras. The early days are so much more fun to write about, back when photographic advances were about people rather than corporations. Many of the major players despised each other, their countries didn’t like each other, and everyone fought like cats and dogs. Even 150 years later, national pride and a host of other factors color all but the most academic articles on the subject. The French, of course, claim to have invented photography and in reality they did. But that doesn’t stop the British from claiming they invented real photography. Nor the Germans from claiming to have originated the entire concept and later perfecting it. Even Brazil, oddly enough, has a legitimate claim to originating the very term photography. When I actually started doing my research, however, I was reminded about the old joke: “What are the last words spoken by 90% of Southern Males? Y’all hold me beer and watch this!! !” Having already taken the leap, I realized I was in wayyy over my head trying to separate fact from fiction. The one article I originally planned has already expanded to at least three articles. It may end up being more. This first section will be about the early development leading up to the invention of the camera: the first efforts to make permanent images from light. It’s largely a story of bumbling efforts and forgotten methods. So many people came so close that the camera really should have been invented long before it actually was. All the parts where there, but no one seemed able to put it all together. The next article will cover the actual inventions (there are more than one) of the camera and the immediate daytime drama that followed. The first thing that was needed to capture an image using light was a device to make an image. But actually, it had been around forever. The word camera came from the camera obscura which literally means darkened chamber. The first Camera Obscura consisted simply of a pinhole in the wall of a dark room: an inverted image of the scene outside the room could then be seen on the wall opposite the pinhole. The use of the camera obscura was first described in China in the 5th Century BC, when a gentleman named Mo Ti used it to trace images. 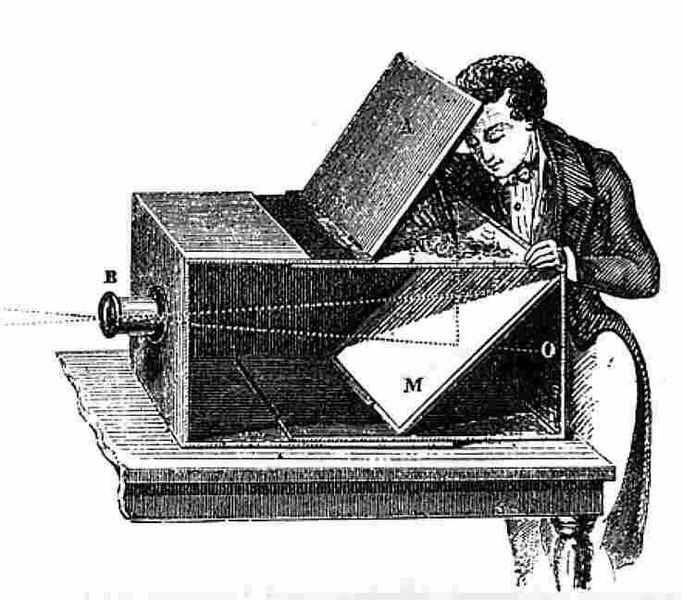 Aristotle and Euclid wrote about the camera obscura in the 3rd century BC and later Alhazen (the father of optics). Kepler, Galileo and Da Vinci all used and wrote about them. Over time the camera obscura evolved into a dark box with a lens and mirror that could be considered fairly portable. It was used as a drawing aid by artists in Renaissance. When, and to what degree, remains controversial but by the late 1500s Giovanni Battista della Porta suggested in his book “Magiae Naturalis” that a camera obscura should be used to sketch all portraits and landscapes before painting. Our boy Giovanni, though, is part of the reason the camera obscura wasn’t discussed too much for the next few centuries. He made a salon in his house into a huge camera obscura by putting a small hole in the outside wall and darkening the windows. He then invited guests over, and arranged for a group of actors to perform outside. He thought his guests would be most entertained by seeing the upside down images of the actors projected on the Salon wall. Giovanni was obviously a really bright guy but apparently forgot, in his enthusiasm, that he was living in Italy in the 1570s. His visitors, being people of that era, realized immediately the images of upside down humans moving on the wall could only be the work of the Devil, ran screaming from his house, and Giovanni spent the next year defending himself from charges of Sorcery brought by the Inquisition. While he was eventually found innocent of sorcery, I doubt he hosted any more obscura parties. While the camera obscura remained in widespread use by artists, it wasn’t widely discussed again until the 1700s. (Whether this was from fear of charges of Sorcery or simply artists not wanting to reveal the tools of their trade, is unclear. Probably both.) By the mid 1700s the camera obscura, along with the camera lucida, was considered a standard tool of artists and illustrators to make sketches for paintings and drawings. The better ones contained focusable lenses, mirrors to make the image upright, and ground glass screens on which the image was projected and over which a piece of paper could be placed to trace it. But, of course, the illustration or painting still had to be made by hand. It was time consuming, of course, but also required at least a small amount of artistic ability to create the permanent image. Overall, though, the story of the camera obscura was one of constant use and steady development, so much so that the first cameras were little more than camera obscuras with light sensitive plates rather than ground glass for drawing the image. The camera obscura was certainly ready to become just the camera from at least the mid 1700s, if not earlier. Only the means to capture the image was lacking. The development of light sensitive plates and chemicals, though, was anything but steady. In retrospect it’s basically a story of forgotten technologies, stops and starts, and missing the obvious. People have also known for a long time that certain chemicals, notably some salts of silver, would darken when exposed to light and heat. Angelo Sala published a pamphlet in 1614 that stated silver salts “Turn as black as ink when exposed to the sun” but Robert Boyle (of Boyle’s Gas Law fame, and therefore considered much more authoritative) felt it was exposure to air, not light, that caused the change. So the silver salt thing got dropped completely for a while. Since you never know just what might turn into gold, Balduin one day decided to dissolve some chalk (Calcium Carbonate) in Aqua Regia and created (without any idea what he had done) Calcium Nitrate. He observed this substance would glow in the dark for hours after it had been heated or exposed to strong sunlight. He published his little recipe in a journal of the time and sent a sample of “Balduin’s Phosphorus” to the Royal Society. Wisely he didn’t send any to the Pope, or I’m sure he’d have visited with Inquisition himself. About 50 years later, Johann Schulze, a German physician, decided he’d like to have some glow-in-the-dark material (who doesn’t) and repeated Balduin’s recipe. But his Aqua Regia had apparently already been used to dissolve some silver and was therefore contaminated with silver salts, so he actually created silver nitrate, rather than the calcium nitrate he intended. Rather than glowing in the dark, the silver nitrate became black when exposed to sunlight. Schulze was a better scientist than Balduin and he clearly demonstrated the effect was caused by light, not heat. He even made stencil images by exposing a piece of chalk (apparently he had some left over from the original experiment) dipped in silver nitrate to the sun: the exposed parts of the chalk turned black while the rest remained white. Schulze even suggested, in a paper he published in 1727, that this chemical change could be combined with the camera obscura to create images.There was a bit of a problem, though. If you wanted to see the image, well, you had to expose the chalk to more light. After a while the whole chalk turned black and the image was gone. Schulze’s work wasn’t forgotten, but since all you could do with his silver nitrate was make temporary images, nobody really pursued it for quite a while. Well, almost nobody. The Swedish chemist and pharmacist Carl Scheele did a lot of further work and discovered, around 1777, that ammonia could be used to dissolve unexposed (but not exposed) silver chloride. This presented the world a way to “fix” silver chloride images, but his findings were ignored or forgotten. It’s too bad, because had anyone read his papers, dozens of men wouldn’t have spent the next 60 years trying to find a way to “fix” images they were making with silver salts. Scheele, whom Isaac Asimov, described as “the hard luck chemist”, also was the first to discover oxygen, barium, chlorine, uric acid, glycerol, and hydrogen cyanide. But he largely worked in obscurity in Sweden and he died young (not surprising after years of working with toxic chemicals, especially when you consider his descriptions included the taste of hydrogen cyanide and the smell of chlorine gas). His papers were were not widely circulated until years after his discoveries, which let others, including Sir Humphrey Davy, get credit for making the discoveries first. Speaking of Sir Humphrey Davy, he, along with famous English ceramic maker Thomas Wedgwood, were the first to attempt to purposely make images from light (the above chemists noted the properties of light-sensitive chemicals, but making images was not their goal). Wedgwood and Davy weren’t trying to make actual photographs, rather they were attempting to make contact prints. Although it isn’t clearly documented, it’s reasonable to assume that Wedgwood wanted eventually to use the prints to decorate ceramics. Wedgwood and Davy knew of Schulze’s findings and spent several years producing silver nitrate images by contact printing on paper, ceramics, and leather. However, they obviously had not read Scheele’s description of fixing silver salts using ammonia, and they never were able to fix the images permanently. Davy did publish “An Account of a Method of Copying Paintings upon Glass, and of Making Profiles, by the Agency of Light upon Nitrate of Silver. Invented by T.Wedgwood, Esq.” in the Journal of the Royal Institute in 1800. This at least documented their groundwork for future experimenters. While it is generally accepted that Wedgwood and Davy were never able to make permanent images, some recently discovered contact prints dating to the early 1800s (below), may actually be images created by Wedegwood, although this remains uncertain. Joseph Nicephore Niepce was the son of a wealthy French lawyer with an interesting history: his family fled the French revolution but he became an officer in Napoleon’s army and later an Administrator in the post revolutionary government. Around 1800 he and his brother Claude returned to the family estates to lead the life of gentleman farmers and inventors. In 1807 they invented and patented the Pyreolophore, an early internal combustion engine. Claude left to go market their invention and Nicephore turned his attention to “heliography” (literally writing with sunlight). He began his work where Wedgwood and Davy had been unsuccesful: attempting to make contact prints using silver nitrate and silver chloride solutions. Like them, he had no knowledge of Scheele’s findings about fixing an image made in silver and all of his initial attempts proved just as temporary as theirs had. Around 1816 he did find he could fix silver nitrate images using Nitric acid. He used his camera obscura to make images on paper soaked in silver chloride, but found them unsatisfactory. He placed these coated plates on waxed lithographs and other objects and exposed them to sunlight. Later he would wash off the plates with turpentine which removed the unexposed bitumen, but left the light-hardened bitumen behind, leaving a negative of the image which was permanent – the hardened bitumen wasn’t going anywhere. He then etched the plates with acid and used them as plates in a printing press. The oldest known Heliograph, made by Niepce in 1825 from a Flemish engraving. He called the process “Heliography” and was able to make fairly good images in this fashion. While the technique was essentially the same as modern photoengraving (photogravure), Niepce was unable to market it successfully. Plus it really wasn’t his true goal: he wanted to be able to make images of scenes using his camera obscura. Niepce, it is said, had horrible drawing skills and was unable to successfully trace the images the camera obscura presented. Niepce proceeded to spend several years exposing plates covered with light sensitive chemicals in his camera obscura, replacing the ground glass viewing screen with his plates. After exposure he washed the plates in his solvents and then exposed them to iodine fumes, which softened the stark black and white images and gave them a more grayscale appearance. Another image, of a set table, was made using a glass plate, which created a negative. The plate no longer exists, but a halftone print of the image still does. The date is not known, but the improved quality of the image shows Niepce had refined his techniques significantly. From his notes and other information, though, it is known the exposures still took hours in good sunlight. Niepce travelled to London in 1827 to visit his brother who was marketing their (supposed) primary invention, the Pyreolophore. Unfortunately, he found Claude had largely squandered the family fortune, had become insane (it’s unclear which event preceeded which) and was physically quite ill. While in England, Niepce called on Francis Bauer, a well known illustrator, and presented him with several of his heliographs hoping he would present them to the Royal Society and perhaps obtain funding for Niepce’s work. Little interest was generated, however, probably because Niepce was understandably cautious about divulging his techniques. So if we define “who invented the camera” as “who took the first photograph, it was clearly Niepce. But his method for actually creating photographs (although they weren’t called that yet), was still crude and impractical. Much more work would have to be done before photography could be considered more than a curiosity. Niepce’s fortunes and energy both waned after his trip to London, and it would not be he who developed cameras that the masses (well, the rich masses) could use. At the time, only a handful of people even knew what he had accomplished. But several others were working toward the same goal. The Showman and the Sheriff would take the next steps, with some help from the Scientist. Followed by claims from a dozen others that they’d done it first or did it better. But we’ll save that for the next article. The Nazi Party in the 1930s made it illegal for any German to accept a Nobel Prize, because the 1935 Peace Prize had been awarded to a German dissident and Peace Activist. When Germany invaded Denmark in World War II, the SS was sent to the Neils Bohr Institute looking for expatriate German scientists Max von Laue and James Franck, and the gold Nobel Medals they’d been awarded. A chemist at the Institute, George de Hevesy, quickly mixed a solution of aqua regia and dissolved the gold medals in it to prevent the Nazis from confiscating them. De Hevesy placed the resulting solution on a shelf in his laboratory and fled. The jar was ignored by the Nazis, just another jar of chemicals on the shelf, for six years. After the war, de Hevesy returned to find the solution undisturbed and precipitated the gold out of the acid. The gold was returned to the Royal Swedish Academy of Sciences and the Nobel Foundation recast the medals and again presented them to Laue and Franck. Ditto what astifter says – what a fascinating read with loads of interesting tidbits, plus the Aqua Regia Appendix was a nice bonus. This is such a great series, please keep researching and writing!